Hi-Tec Recycling is sponsoring a recycling event from 9:00 a.m. to 3:00 p.m. in the Pavilion parking lot. Bring your computer components, household electronics, consumer electronics, and scrap metal and drop them off for free. For more information, call 800-981-9019 or email info@htrecycling.com. “Oil and screen” surface work will take place on Madrone Drive between Highway 17 and the post office on Thursday, August 22, 2013, from 8:00 a.m. to 6:00 p.m. Detours will be in place for people coming and going to that part of Redwood Estates, but you may find it more convenient to use a different entrance into our community for that day. Saturdays and Sundays noon – 6:00 p.m. Many thanks to all who came out for the Pool Party on August 18. 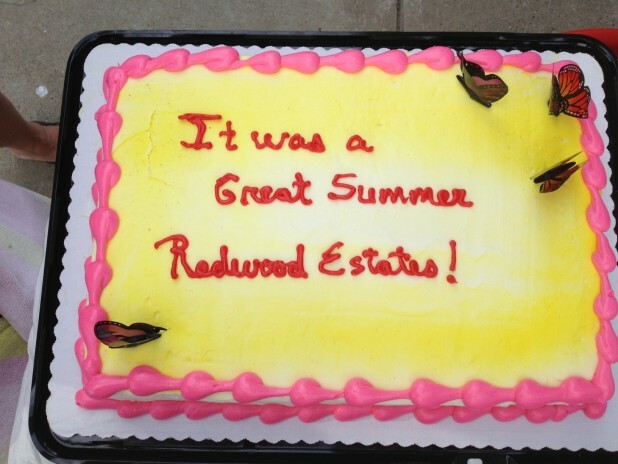 There was lots of food and cake, and a great time was had by all to wrap up the summer. Participating groups provide a wide range of public safety information. The sheriff’s departments bring specialty equipment and personnel. In past years, there have been SWAT teams, bomb-detecting equipment, search and rescue dogs, and fingerprinting for children. In addition to fire truck tours, the fire departments will offer information on home and wildland fire safety. Find out what the local amateur radio club, CERT, and the Mountain Emergency Response Corps do in a major disaster. Many of the groups provide special activities for children. Nonno’s will serve a barbecue dinner for the low price of $5.00. Veggie burgers will be available. Purchase dinner tickets at the event, or get them in advance at Nonno’s or the RESA office (check office hours here). The Loma Prieta Community Foundation and the Redwood Estates Services Association host Mountain Residents’ Night Out. For more information, call Mona at RESA, 408-353-1866, or Sue at LPCF, 408-353-2832.